Battle Pass Tiers (10 Tiers 100 Stars) for 900 vbucks. 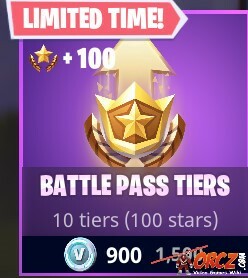 Special limited time offer on 10 tiers (100 stars) to advance your Battle Pass. Purchasing a Tier normally costs 150 V-Bucks. With this offer that appears sometimes in the Item Shop, you can purchase 10 tiers (equivalent to 100 Battle Stars) for 900 VBucks instead of 1,500 V-Bucks.